Hello there, crafters! 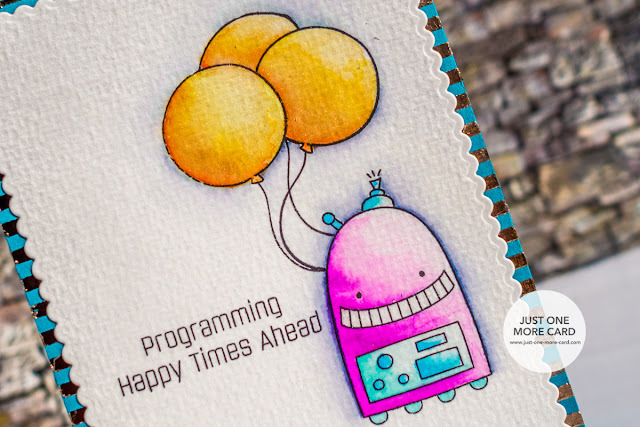 I was lucky enough to get my hands on one of the new stamp sets by My Favorite Things called "Bionic Robots". I love gadgets and technology and these robots are so cute, they immediately found a place in my heart. 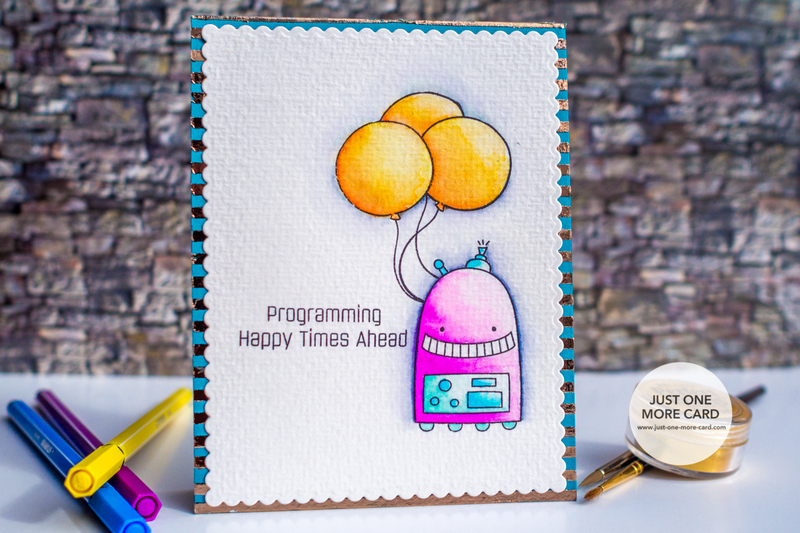 Even though robots are most often associated with high technology, I wanted to create a playful and happy card. That's why my coloring doesn't have any of the grays or maybe blues that you would usually associate with a robot. As a coloring medium I used my Stabilo pens. I know that you have seen me use these pens so far to achieve a very intense coloring, but you can use them perfectly as a watercolor medium. I simply scribbled the color onto an acrylic block (you can use any piece of plastic or acetate as well) and then picked it up with a damp watercolor brush. I worked in multiple layers to slowly build up the color because I wanted to be sure to have proper highlights on my robot. I also found that the Stabilo pens, when used as a watercolor, can give very smooth and perfect blending. The balloons are from a Wplus9 stamp set and I stem them repeatedly, with some masking. I started coloring them with the lightest color and then it dropped in the darker colors to achieve some shading. As with all watercolors, remember to not work in adjacent areas when the first area is still wet. You risk one color bleeding into the other one. Thanks for stopping by today and I hope you have a very happy day! Did you know that you can create short links with OUO and receive dollars for every click on your shortened links.